Ambrose Palamo is an aviation student who wants one thing: to go home to Samoa. But when Portland is leveled, and he meets Vicki, he promises to help her find her fiancé instead. What he doesn't expect is the feelings that start to form for her as they search the dangerous Oregon woodlands. Sometimes love isn't what you think it is. Where did the book idea come from? Oddly enough, this book came up from the song "Leavin' on a Jet Plane" by John Denver. I was at the gym one day when the song came on and I started thinking about a couple embracing at an airport where one of them is leaving and not coming back. I kept thinking about it all day - why wasn't he coming back? What if he doesn't love her, and he's trying to escape? But why would he do that? Does he get kidnapped by terrorists? What if the airport was bombed and America was invaded, and one of them was lost? It just rolled downhill from there: what if they had to escape the end of the world and flee Portland, Oregon, a perfect place for an invasion that no one ever considers. 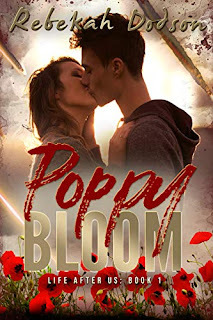 So, I sat down to write what became chapter two of Poppy Bloom that very day. Over a few months, a friend and I started bouncing ideas between each other, and Vicki and Ambrose as characters were born. From start to finish, I wrote all three books in the series in about three months. Originally I didn't intend for Ambrose and Vicki to fall in love. They were supposed to find Will and Ambrose was supposed to show up later and he and Vicki would fall in love, but as I wrote I realized there was no holding them back. They developed their own chemistry along the way and I couldn't keep them apart, thought I tried! So Life After Us truly developed as not only the life after those two, but also like after the United States of America collapses. May that day never come for us, but for Vicki and Ambrose, it all started the day they were leavin' on a jet plane.